The Global HF Series High Flow Cartridges address your need for absolute rated filter cartridges in high flow rate applications. General Grade Teflon® Cartridges are designed for multi-purpose use wherever a cost effective Teflon® membrane cartridge is required. Food and Beverage Grade Nylon 6,6 Cartridges are naturally hydrophilic requiring no surface treatments that can leach into your process. 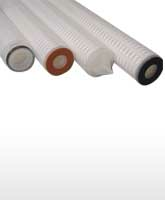 Food & Beverage Grade Hydrophilic Polyethersulfone (PES) Membranes have been designed to comply with all FDA requirements for the food industry. Our hydrophilic polysulfone membrane is suitable for use in a wide range of critical water and aqueous filtration applications. 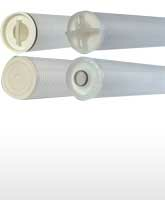 Pleated Glass Micro-fiber Cartridges offer an economical, absolute rated filtration solution for both liquids and gases.